First, I’m going to start off by saying that Lucerne has my heart. There, I said it: Lucerne is hands-down my favorite city I’ve visited (so far) in Switzerland. Despite staying only a night in town, I was immediately captured by its beauty all over, and I wish that I could’ve stayed longer to explore more of what the city had to offer. It’s definitely a Swiss city that everyone must stop by while in the country– it would be a shame to miss out! After spending half a day exploring the Swiss capital Bern, I took an *expensive* train ride to Lucerne (also written as “Luzern” in German). The journey only took an hour, and I soon arrived into the station at about 15:00. My Couchsurfing host, with whom I would spend the night, wouldn’t be off work until after 17:00, so I had some time to explore the city on my own. With that said, I set out to check out the sights. The city is pretty small, at about 81,000 inhabitants. Size-wise, it’s quite walkable, as I was able to easily get from one place to another on-foot. 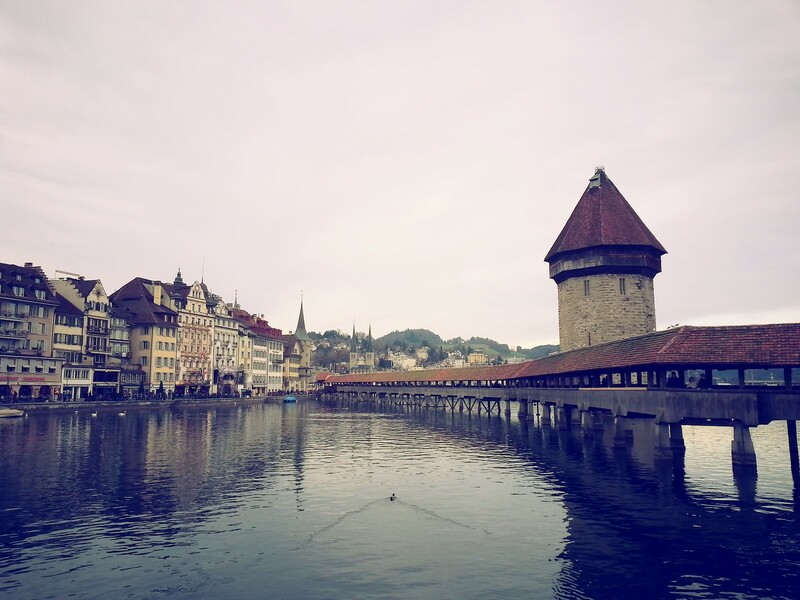 Despite its compactness, Lucerne is a notable tourist destination– in fact, it was quite crowded when I visited, and I later discovered it was because of the Carnival (Luzerner Fasnacht), a city-wide celebration of parades, costumes, and tons of partying. I happen to come across a huge fanfare along the Reuss river, where hundreds of people– locals and visitors alike– were decked out in colorful attire, playing music while throwing confetti everywhere as they marched across the Rathaussteg. To avoid getting swallowed up in the crowd, I sidestepped away from the procession and headed to the iconic Kapellbrücke, or “Chapel Bridge.” It’s a wooden bridge along the Reuss that dates back to the 14th century– what makes it so special was that it has survived three massive fires: one in the 14th century, another in the 16th century, and one most-recently in 1993. The recent fire was especially destructive, as nearly two-thirds of the paintings along the bridge were burned– thankfully, extensive work was done to restore as much of it as possible, and it was quickly reopened a year later. Today, it remains a notable landmark for visitors, and it’s worth a walk over to admire the interior paintings depicting its history. Aside from the Kapellbrücke, the city of Lucerne is incredibly picturesque. One can get stunning views along the Reuss and Lake Lucerne, with its neighboring Mount Pilatus in the distance. 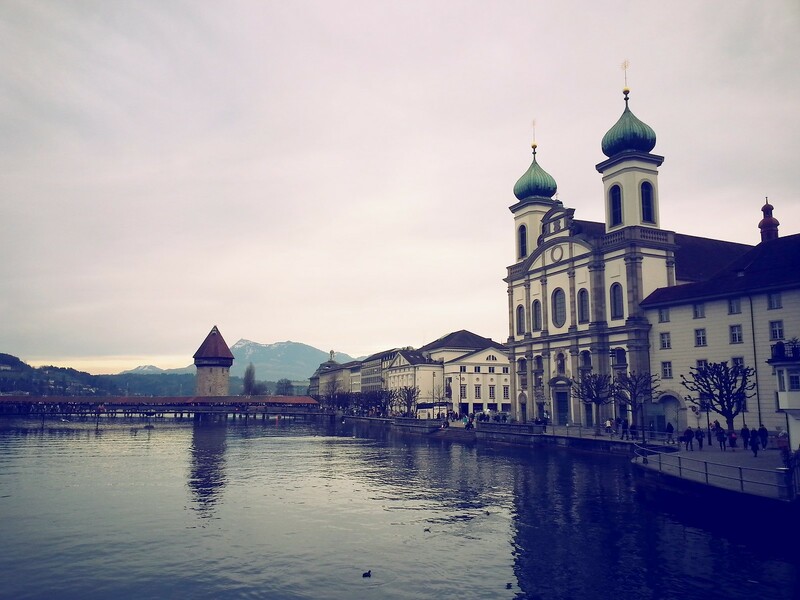 If there’s one city that could be considered Swiss, then Lucerne would be one of them! Still within the center, I headed to visit the Church of St. Leodegar, which is distinctive for its yellow exterior and two, towering spires that can be seen from just about anywhere in the city. It was built during the Thirty Years War in the 17th century, and it functions as both a monastery and parish church today. 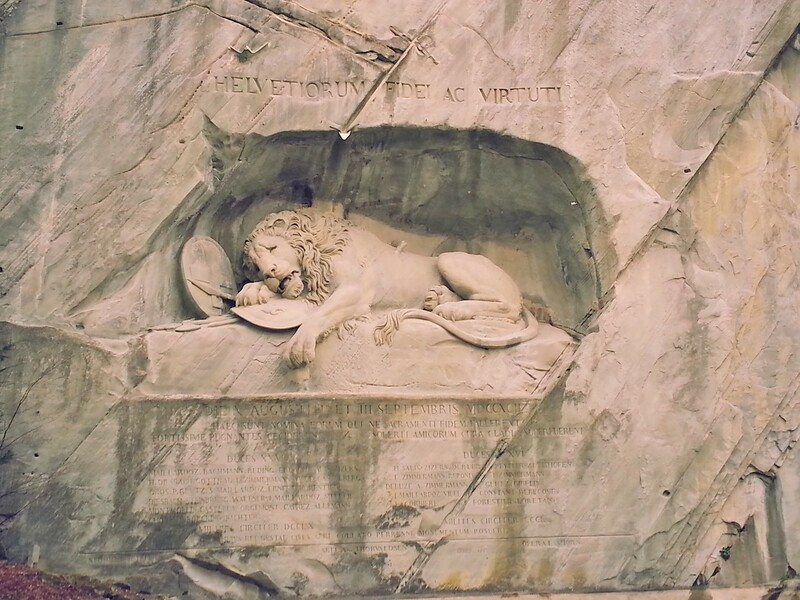 TL;DR The Lion Monument isn’t actually depicting a lion sleeping, but rather mortally-wounded. Makes sense, as it’s to commemorate the Swiss lives lost during the French Revolution, which makes the statue quite tragic in meaning. Still, a beautiful piece to admire! I crossed the Kapellbrücke, and I made it to the other side of town. There was the towering Jesuit Church, which at first I’d believe to be an Orthodox church due to its two small onion-shaped domes, but in fact is Catholic. It made for a distinctive sight along the Reuss, in addition to the Chapel Bridge itself. Jesuit Church along the Reuss. Passing by the small, unassuming Franciscan Church, I made it to my Couchsurfing host’s flat close to 17:00, and she let me in. A young woman in her mid-twenties, she originated from the French side of Switzerland and had moved to Lucerne (on the German-speaking side) a year prior for work. She was still figuring out the city, along with learning German, as I got to know about her after I got settled in. We cooked a simple dinner together, and we chatted a bit more before deciding to head out to explore Lucerne in the evening. It was quite chilly outside, along with a bit of rain. The Carnival had since ended for the day, so the streets were really quiet. After perhaps a half-hour stroll, we headed back to her flat where she introduced me to a Swiss-French TV series (of which we watched an episode), and she played a bit of the accordion afterwards, as she was learning it. Soon after, I went to bed, super tired after traveling and exploring both Bern and Lucerne in one day. Originally, we’d planned to go to Mount Pilatus the following morning, as I was told that one could get lovely views of Lucerne and the Alps from above. Unfortunately, it looked overcast that day, which wouldn’t be worth visiting, so we decided not to go. 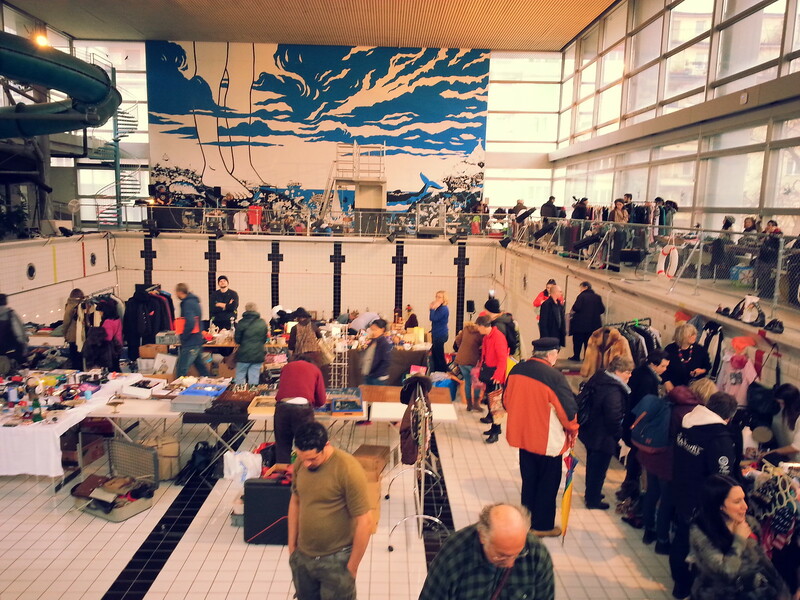 Instead, my host took me to Neubad, an indoor flea market which had been a community swimming pool before. It was interesting to walk around the place, seeing dozens of small stands selling items in a drained-out pool! At the Neubad flea market. Afterwards, my host brought me to a small tea house, where we had a light lunch-early tea time. 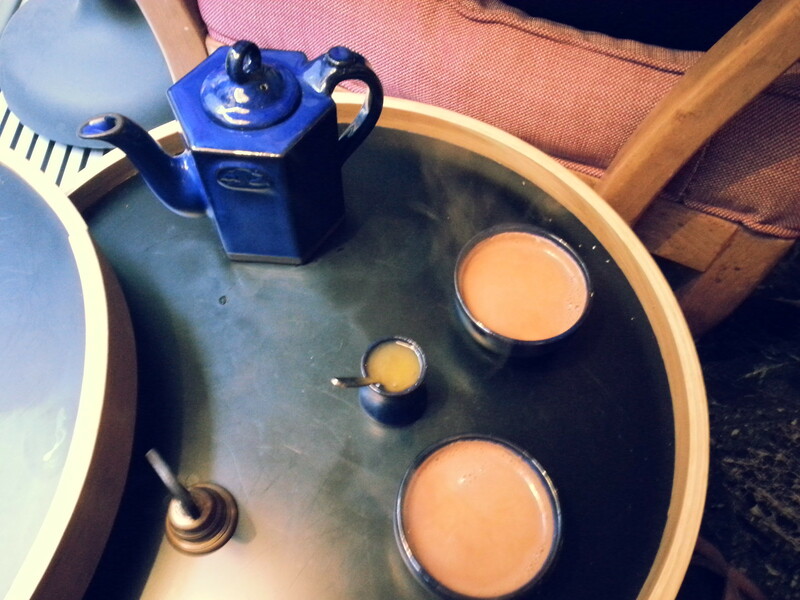 We ordered Mediterranean food, along with a pot of chaï. It was surprisingly affordable, as the meal came out to exactly 20 CHF (18 euros) in total for two people. Although not exactly filling, the meal nevertheless kept me going for the rest of the afternoon. Nearing 13:00, we headed back to my host’s flat, where I grabbed my belongings. I was to be at the train station at 14:00, where I would be catching a BlaBlaCar ride to my next destination. My host accompanied me over, and from there I said goodbye to her, as well as thanking her for the short, but pleasant stay. Overall, I hadn’t expected Lucerne to blow me away, but it did. Again, I wish that I’d given myself more time in the city to explore more. 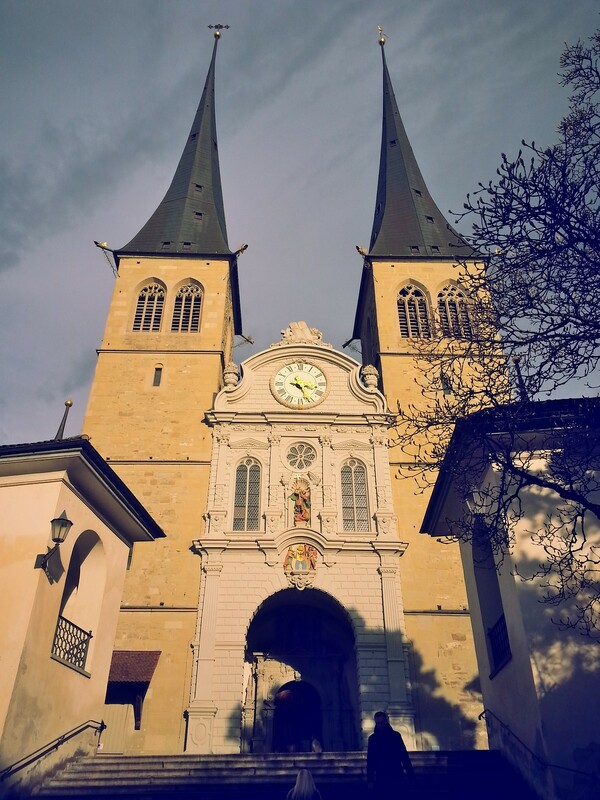 The city is unbelievably picturesque, even more so than the previous Swiss cities I’d visited– I also had a lovely time Couchsurfing, as my host was really pleasant and showed me around plenty of the lesser-known spots in town. 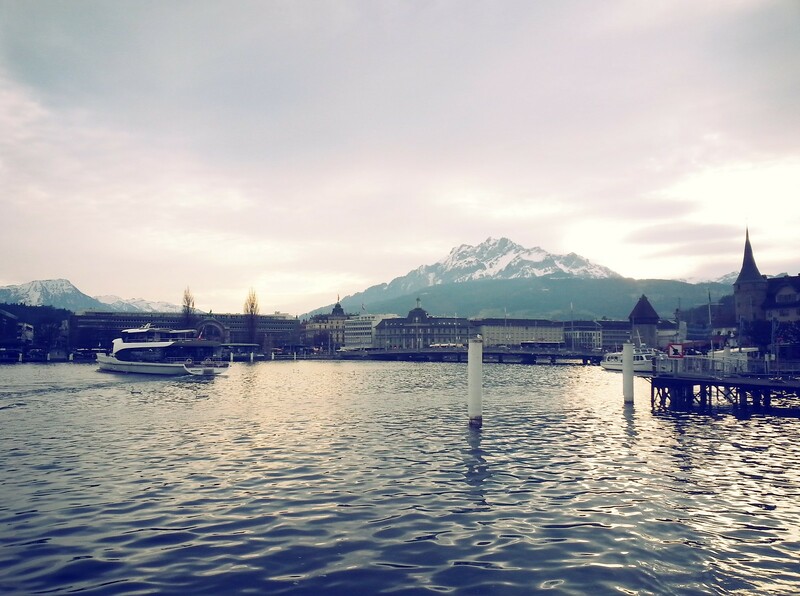 Should I ever return to Switzerland, I would love to visit Lucerne again. I’ll be publishing my final post of my trip to Switzerland soon. Coming up: Zurich, Switzerland! It is a truly stunning place. 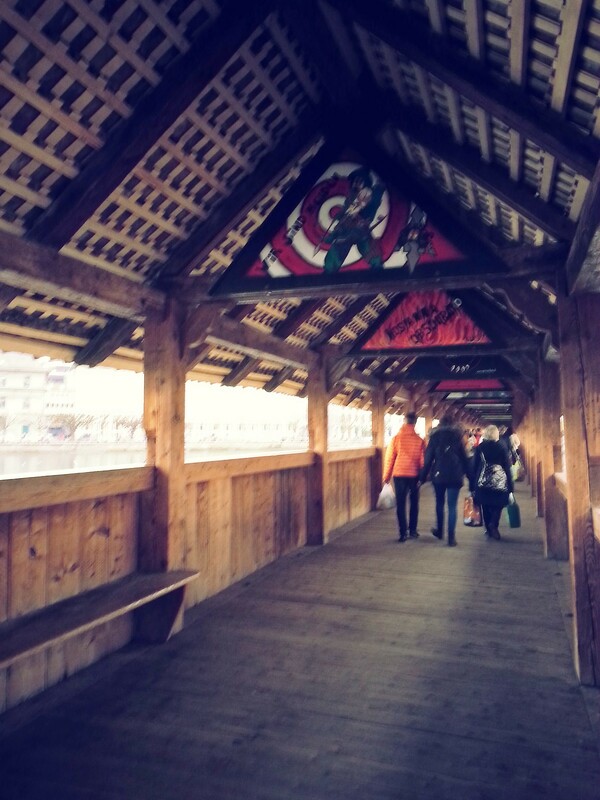 The restored wooden bridge is just a wonder. I love the views to the mountains. Great post. When I visited Lucerne, Carnaval was also in full swing! I love it when you run into things like that without having planned it. I often find it’s those unexpected parts of a trip that I remember the most! Agreed! Visiting in the middle of a festival without knowing it is a surprise, but never an unpleasant one. Would’ve been fun to have participated in it when I was there!